Designed to last 1,000 years, the construction of Pine Hollow Institute employed some of Michigan’s finest craftsmen, who worked with architect, Roger Hummel, and founder, Leslie Lee to create an impeccable 17,000-square-foot establishment that has already hosted a list of ambitious non-profits. A highlight of the upcoming Northern Home & Cottage Home Tour, Pine Hollow’s mission and sheer magnificence marks a place on the map for the world to see. Raised on a seventh generation homestead on Torch Lake, Leslie Lee grew up with a profound sense of belonging to Northern Michigan’s landscapes and fresh waters. In praise of her ancestors, Lee shares, “I’ve been incredibly grateful to my parents, my grandparents, and my great grand parents for holding on to that property when they could’ve sold it, but they didn’t because they were thinking forward to the future generations.” In 1991, Lee sought to further the principles of her family legacy by purchasing several acres of land in Elk Rapids, known as Pine Hollow. For half a century, the parcels functioned as a cottage resort. The property was dotted with tiny fishing cabins overlooking Lake Michigan. “We purchased the land from a developer who wanted to build condos, but prior to that, it had been a cottage resort called Pine Hollow. Most of the people who lived in the area spent some time in those little cabins,” says Lee. With six hundred feet of sandy Lake Michigan shoreline, Lee knew she’d found her destination. For Lee, finding the right architect was serendipitous. “I looked in the yellow pages. I found three, wrote them, and asked them to send their portfolios … the second portfolio I opened was RogerHummelss. I opened it and said, ‘Wow! This is it!’” After discovering the exquisite portfolio of Suttons Bay-based architect, Roger Hummel, Lee spent two years researching and planning with Hummel, who hand-drew the first blueprints. 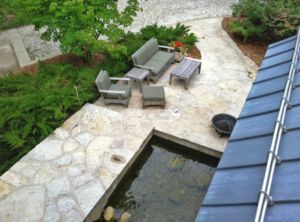 With more than forty years of home design and a partnership with Northern Michigan’s sought-after architect, Glenn Arai, Hummel brought a high level of expertise to the project. “The most important criterion we outlined was for Pine Hollow to last 1,000 years. It changed the way we did everything. 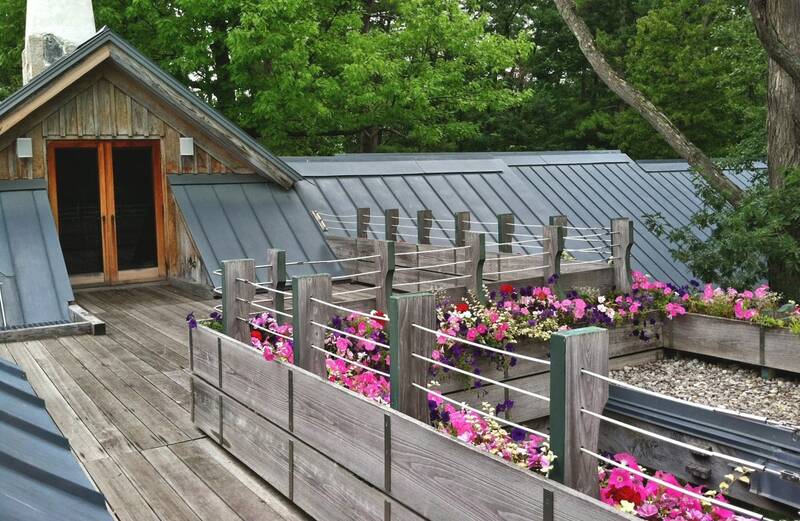 Story after story, we incorporated this concept into the zinc roof, the wiring, the plumbing…” notes Lee. To realize their mission, more than 300 of the finest craftsmen from across Michigan were invited to bring their talent to the construction using materials from the Great Lakes region like limestone, fieldstone, zinc, white oak and pine. Now, more than 15 years since its inception, Pine Hollow exudes raw strength. Every detail down to Hummel’s custom brass window levers is imbued with purpose and crafted with excellence. Showcasing 12 bedrooms, 7 fireplaces, a 25-meter indoor swimming pool, and 15 bathrooms, Pine Hollow’s rustic elegance extends seamlessly throughout the interior to the surrounding grounds where native wildflowers and trees grow beside an untouched shoreline. Lee’s family principles of longevity and endurance come to life in the white oak timber frame and gigantic glacial scraped hearth-stones that greet you when you first step inside. Deep overhangs, intimate nooks, verandas, and nautical nuances define an architectural experience unlike any other. After nearly two years of living at Pine Hollow, Lee’s first two teenagers graduated, and she decided to move back into her “normal sized-house” just down the road. It was time for “Pine Hollow to grow up and get a job,” Lee laughs. Lee committed Pine Hollow to a greater cause: to provide a place of excellence where non-profits could be hosted and inspired to work on the issues of the present day, particularly environmental and freshwater issues. To launch Pine Hollow’s first chapter as a full-time institute, she published a book, Sacred Space. Filled with architectural photographs captured by acclaimed photographer Hedrich Blessing and lyrical prose written by Lee herself, Sacred Space sets the tone for Pine Hollow’s ambitious future, because, like her ancestors, Lee is “looking forward to the future generations, too”. The future of Pine Hollow is already a legacy. It was from the day Lee and Hummel met. It’s a project that proves that when the bar is set high, say one thousand years into the future, we can reach to grasp it, just like the 300 Michigan craftsmen who did. Come experience Pine Hollow and 10 other stylish homes at the Northern Home & Cottage Home Tour on Saturday, September 13th, 2014.